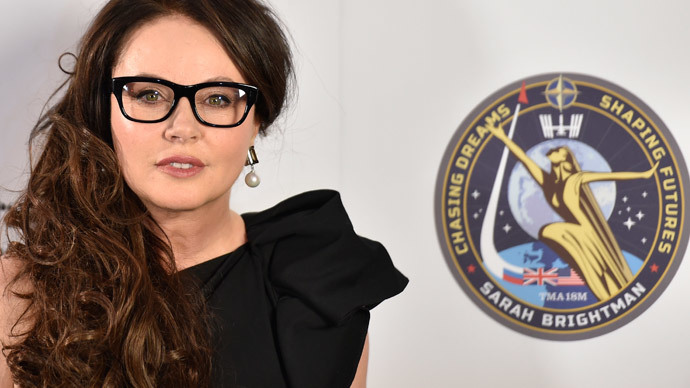 Singing sensation Sarah Brightman, who will travel to the International Space Station (ISS) in September, discusses rumors that her trip is a marketing stunt, talks about the pitfalls of singing in space, and gives an update on her Russian lessons. Brightman – the erstwhile wife of Andrew Lloyd-Webber and the owner of a soprano voice that has sold 30 million records – has been in constant media spotlight since announcing her intention to become the eighth space tourist back in 2012. Among the many questions posed to her is how she can afford the reported $52 million fee for the 10-day experience. Last month, a long investigation in the Daily Mail showcased links between the singer – who is a superstar in China – and Reignwood, a Beijing-based conglomerate which will be transmitting her missives from space. “I have paid for the trip myself,” a defiant Brightman told RT’s Sophie Shevarnadze, when asked about the financial commitment to become the second-ever female space tourist. The 54-year-old plans to become the first diva to sing from space, reportedly enlisting her former beau Lloyd-Webber to pen the lyrics. This is not the only preparation Brightman has been doing, since starting her mission training at Star City on the outskirts of Moscow. The London-based singer described her routine of six o’clock starts, grueling days of being subjected to super-g training, and equally grueling marathon Russian lessons. “It’s very intense. Well, luckily when I was younger, being a classical singer, I learned a lot of the Rachmaninov material for soprano, mezzo-soprano, so I had a feeling for the language, and I felt 'Oh, I’m going to be fine.' So, I get to Star City and we start with four hours, four hours a day, amongst all the other lectures that I have,” said Brightman, who was trained at the Royal College of Music. But the ‘Cats’ singer believes she learned the most from completing the notorious winter survival training, when potential cosmonauts are dropped off in the woods and have to fend for themselves for 72 hours. But despite bringing more media attention to space travel than an already notable line-up of celebrities who have been to space, Brightman, a UNESCO ambassador, says she is no space messiah. “I’m not important enough as a person or knowledgeable enough or arrogant enough to say 'I’m going to try to do good with this.' I’m an artist, and I want to go and do this trip because it’s a very personal journey for me. But what I have found, and I found this with space in general, when you talk to people about this particular journey, or they ask questions, there’s an incredibly positive light in people’s eyes,” Brightman said.